We're always looking for ways to expand our, already extensive, eLearning Hub with My Learning. 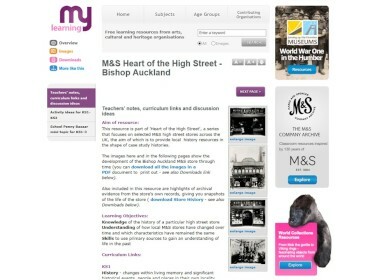 Following a period of consultation with teachers we decided to add two new sections to our Hub, M&S Timelines and Heart of the High Street. 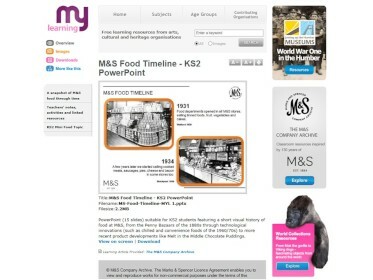 Our Timelines take four key areas of M&S and show how those products have changed over the course of our history. 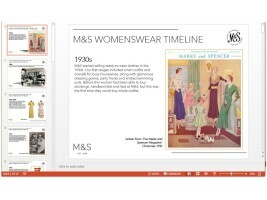 Covering Food, Packaging, Womenswear and Menswear, the Timelines are presented as PowerPoint presentations, making them really easy to use in the classroom. Each Timeline is accompanied by a set of teaching and discussion ideas, a gallery of images and links to further resources. They're a great visual resource perfect for looking at continuity and change over time. Heart of the High Street was created in response to a call for more Local History resources. We have started with six case studies, each one looking at the lifespan of a local store in different towns around the country. 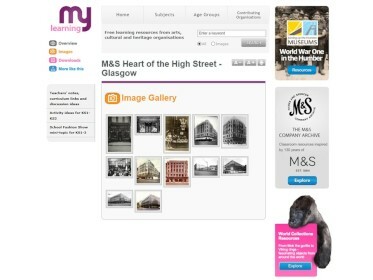 With wonderful images dating right back to the turn of the century and detailed store histories, Heart of the High Street will help pupils to look at how their own high street has changed and opens up lots of opportunities for historical enquiry and fieldwork. There's so much to explore, start your journey of discovery here!